During the period between Xmas 2010 and New Year 2011, I must have stubbed my toe and the nail cracked, split, then became infected. It was very painful and I went to the nurse who told me that it would be fine if I bathed it in salt water. Things started to improve but the toe was still painful. On the 13th Jan 2011 I was bitten 4 times by an insect. It later turned out that there was a flea infestation at work. On the 14th Jan I had a very sharp pain on the top of my foot. I didnt really give it a thought because I assumed that it was caused by my trainers being too tight. Saturday 15th soon after midnight I got up and nearly fell over with the pain. Took some pain killers and went back to bed. At 5:30 I got up and rang NHS direct who told me to expect a call back within the hour. It was 9:30 before I got the call back. I was told to wait for a doctor to call and then get myself to the local hospital for the appointment. 12:30 The doctor gave me 2 lots of Antibiotics and told me to call back if it didn’t start to clear up. 15:00 Things were getting worse I was getting delierious we called back but it took another couple of hours to speak to a doctor. 18:00 We went to casualty at the main hospital where I stayed for over 2 1/2 weeks. That evening my blood pressure dropped to dangerously low levels, A&E staff started IV drips in an attempt to increase my blood pressure as well as several antibiotics, the ones that they ended up giving me were Meropenm (IV) and Metronidazole tablet. I was moved to AEU by 10pm, by this time I was feeling a little more comfortable. The infection had spread to just below my knee. The infection started to spread up my leg, the rate of spread was very rapid by the end of the next day 16th Jan it had spread up to the top of my thigh. The doctors came round and were very concerned that I may loose my foot. I was in so much pain I didn’t really take in what they said. The pain was excruciating, the swelling immense. When I put my foot down it turned black with pulsating yellow. It was so painful that even morphine was not touching it. The 17th of Jan a very low day, the lowest day. The doctor came round again and the microbologist, the doctor was extremely concerned that I may loose my foot and possibly my leg. The microbologist suggested a very strong antibiotic called linezoid. Whist this was being arranged I was moved to Medical Ward 3. The AEU doctor personally saw my transfer (much to the amusement of the staff as it was very rare that a doctor escorted a patient). Things started to get worse when the Linezoid got lost in the system and the doctors were concerned that I may get pneumonia. Great! By that evening I thought I wouldn’t see the morning. One of the night staff nurses was so concerned that she started ringing round the wards in order to find the antibiotics. They finally arrived at about 2:00am. I am pretty sure that was the turning point and the start of my recovery. Fully loaded with 3 types of very strong Antibiotics things started to improve. The redness and swelling went down almost as quickly as it came. Apart from the foot which was excruciating and the simple task of sitting up to eat was so painful it is impossible to describe. my skin just peeled, it was amazing just how quickly it started to shed. The antibiotics were stopped and I was monitored for the next 2 days before being released on the 3rd Feb. During this period I started to use crutches to get around. My body ached from head to toe, I felt like I had flu. Walking was very difficult because just putting my foot down made the lower leg go purple and it was still very painful. Feb 9th one week on. Everything is a struggle, my lower leg still turns a deep shade of purple. I am so tired, all I am able to do is to lie on the sofa, even daytime TV was too taxing. By mid February I am itching to get back to work. I start to work from home for a few hours a day. By the end of February I am a little bit more mobile but still the leg is purple, swollen and painful. I am almost working a full day. During March I am working full time from home. Still struggling to get around but things are improving. Then disaster! I started to get chilblains on my RIGHT foot. I had kicked my middle toe (seen in photo above) at the end of February and the chilblains took hold around the middle of march. Unfortunately the redness started spreading up my middle toe so I started taking antibiotics as a precaution for two weeks. My doctor put me on nifedapine to try to increase the blood flow to my feet. The chilblains started to recede and I stopped taking it. Saw my consultant on 13th April and was sent for multiple blood tests, I think there were 16 in all. I am advised to go back on nifedapine. By the end of April I am more mobile, still cant drive because of the clutch and the swelling/burning pains that still occur when I put my foot down. I am currently back on the nifedapine and due to go back to the consultant tomorrow. 11th May. I have swapped my car for an automatic and for the first time will be taking myself to the consultant. The consultant explained that the burning sensation is down to nerve damage, it should heal but will not be a short term thing. She has suggested that I have Reynaulds Phenomina which explains the cold fingers and toes and will continue to take the nifedapine until I have the results from my Doppler test which is due at the beginning of June. We have been away for a few days, whilst the weather was cool I found that I could do quite a lot of walking and also found that my fingers were warmer. As the week progressed the sun came out and as the temperatures rose the swelling increased. Still it was good to get away both mentally and physically. Doppler test day. The doppler test was quick and easy, the doctor had an ultrasound device linked up to a computer and some jelly to put on my leg. He scanned both legs from foot to groin and told me that there was a good blood flow on both sides. The problem is more likely to be within the smaller veins but the machine is not sensitive enough to detect them. Went to work for the first time this year, its the best part of an hours drive and up till now I haven’t felt comfortable driving so far in one day. I only went in for the morning to attend a meting. Driving was hard work, and by the time I got back home my ankle was sore. On the way back I noticed that my eyelid was slightly swollen. Ringing in my ears were the words ‘if anything unusual happens and you start to get swelling go straight to the doctor’ so to be on the safe side I called into the Chemist (drug store) to see if he could reassure me. He suggested it could be a steye and gave me some drops. Woke to a swollen eyelid, my eye was sore and to be honest I started to panic, I had read about pre-orbital cellulitis and orbital cellulitis and wasnt taking any chances. I went to the doctor first thing. She was very good and whist she was pretty sure it was just an allergic reaction, she gave me some antihistamine drops and suggested hayfever tablets. I was to go back in the afternoon. By 4:30 things had not got any worse, the doctor was very happy to see it had not changed. To be on the safe side she gave me some antibiotic drops. 4 days later it had cleared up. PHEW. Its been cold here in the UK and my fingers were really cold, trying to type is hard and seeing as it is the main part of my job, I need to get things sorted so I went to my doctor. Since the scare with my eye I had been monitoring my blood pressure and noticed it has been higher than usual so my doctor suggested an alternative drug called felodopine, this is a once daily drug that does the same as nifedipine but is supposed to be more tolerated. Been on Felodopine for just over a week and apart from the first few days of dizzy spells, I seem to be getting on ok with them. Typically the weather has got warmer so I cannot be sure but washing fruit for the children’s lunch box is a lot less painful than it was. The hot weather at the weekend did not affect my leg as much as I was expecting, mind you I was just sitting in the garden, it was over 30 degrees and when its like that in the UK its not the sort of heat that encourages you to get up and about. I have been suffering with cellulitis in my left lower leg sence August of 1998. This infection has consumed my entire life, 2011, over 150 plus hospital admits later and I still take meds for prevenitive care. Mine is now considered cronic as it has damaged all my lymph glands in the left leg it is hard for me to flush out any type of infection and lord only knows what triggers it on. I am now dealing with chemo for colon cancer and my biggest fears have arived, after 8 treatments with 4 more to go what you know, my leg is getting red because my immune system is very low. i just wanted to thank you for shareing your story with the pictures so others who experience this will know they are not alone. When I am admitted in the hospital I recieve IV cubicin, Vancomycin, Demerol and Visteril and a blood thinner to prevent clots and Torodol for inflimation. When I am home I take 150mg of clindimycin daily and increase to 300mg 4 times a day when a flare up occurs with 800mg ibuprophen for inflamation, 7.5 percet for pain and my infectious deaseas doctor is always on call whom may I say saved my life many times. My cellulitis was caused from falling out of a kyak in stagnated water, I don’t know if I scraped my leg, or something bit me so they called it a marine bacterial infection. Hope this helps and good luck. Oh and a JOBE STOCKING helps when being ambulatory, it is a stocking that is made special ordered and fitted for the patient with a doctor perscription through any medical supply store. Thank your both for your comments, I am hoping that this site will give people information based on real people’s experiences. Before this happened to me I had heard of Cellulitis but didn’t realise that it was one of these ‘cover all’ type diagnosis. Merri Lee, sounds like you have had it bad. I really hope that the chemo works well for you and that your leg behaves itself long enough to see you over your treatment. I was extremely pleased to discover this site. I thought I’d say thanks for putting up this excellent post! I’m certainly loving every part of it and I’ve saved the blog to check out new information you publish on your blog. Thanks for detailing your experience here! Man, I hope you remain on an improving trend and have this all behind you. I started on improving trend yesterday morning, 12 hours after IV antibiotics begun. Unless drastic change, I may go home in 1-3 days. Sorry to hear you are suffering. I am keeping my fingers crossed for you and hope you make a speedy recovery. The antibiotics made me feel really tired and flu like and after talking to a fellow sufferer, its not unusual so try to be strong. Please post again as you recover, it would be good to hear from you. Good luck & hope you are home soon. Progressed again today. Redness, swellong, and tenderness nearly gone. Current plan is to discharge me with oral antibiotics tomorrow. I will have been 5 days at the hospital. Maybe I can write a chronological account like yours, includong the medications. Hopefully my post-discharge recovery will go well and stand as an encouragement to future readers. I will keep ypu posted, wherever it goes! I was discharged as planned, on Saturday afternoon. Exactly one week from the first small red spot on my knee. I received IV antibiotics for six days straight, including Saturday of my discharge. My big toe was the last to show problem signs, and the last to resolve. Like you, the toe and foot were excruciatingly painful. Now, all redness has gone, even when the foot is down. I am still keeping it elevated as much as possible. There is still slight pain beneath my calf in the back, and the big toe. I am optomistic that all pain will be gone soon. How are you since you last wrote at the end of June? Improving, I hope!! So glad to hear you are out and improving all the time. Sounds like you got a 5 star treatment, hopefully this will make your recovery will be short . As for me I am getting there slowly thanks, I will update my blog soon. Hi, Thanks for posting and I am glad this site has been useful. I set it up because of the lack of information and can sympathize with you. I know every case is different but for me the first 3 months were the worst but 6 month on and I am still feeling sore. The difference being for me is that the pain has gone from the worst pain imaginable to something more like bad sunburn. Please keep posting on your progress, the more people who contribute, the more useful the site will be to fellow sufferers. So happy to hear you are on the mend with this horrid cellulitis. I just experienced this for the first time this past month. I had a wonderful Sunday then came home and felt …off. Laid down got the chills/nausea and tired. I woke in the am to discover redness down my right calf into the ankle area. I immediately went to my Dr. who put me on oral meds which I was not responding to for 4 days. On the 4th day I was put on IV for 4 sessions and back on oral for 5 days. My leg is pretty well normal except for slight reddness and into the foot. My ankle and foot still slightly swollen and by the end of the day tight. I made a followup appt for Aug. 15th to discuss the swelling. Truthfully, lately this past Spring I had broken / cracked heels and I beleive this is wear the bacteria got in. I am trying deperately to improve my heels, and pray I never go thru this again. It was scary and painful. Thanks for your post. A neighbour of mine caught cellulitis through a blister in her foot caused by new trainers (sneakers) so you are probably right. I have heard that tea tree oil is good to keep the bacteria out so have used it when I get a cut or a bite. Not sure if it works but I am prepared to try anything to save going though that again. Wish you well with the recovery and the follow up, it sounds like they have you on the right antibiotics so I hope things continue to improve. Please post again to let everyone know how you are doing. Richard, how are you doing? I am pretty much ok now, tho mentally still messed up about what happened having cellulitis. I find myself always wearing socks and full out shoes, no sandle or open toed. My skin on my leg started shedding alot this past weekend. The swelling finally coming down around the ankle area but my foot and leg are discoloured still. Oh the joys! I liked the comment my beautician told me. ‘Nancy, Cellulitis is one step down from flesh eating disease’. thanks, i needed that… not! I am doing well thank you. Have been out and about for a few days and although I still have some discomfort I do feel that I am beginning to understand my limitations. Standing in a queue is the worst for me. I love your beautician’s comment because it is true and it really makes you think how lucky we are to have survived it. I know what you mean about being over cautious, I am particularly concerned about being bitten by mosquitoes or gnats and am always the first to be bitten so find myself carrying a bottle of mosquito milk where ever i go. As for the discolouration, mine is still there but much more subtle than it used to be. That may be because it is summer so it will be interesting to see what happens when the tan fades. Make sure you keep well moisturised even after your leg has finished shedding, it is quite amazing how the body can shed the skin at such a rate and afterwards still look normal. Keep positive & good luck. This is my 3rd go round with this demon. In 1995 I woke up – my first day of vacation – with a high fever and a sore right leg. Being a “tough guy” I ate fever reducers and didn’t go to a doctor until my leg was huge and red. I finally went to the doctor, which sent me across the street to hospital and I was on IV antibiotics for several days. They sucked gallons of blood from me (not literally, but it felt that way) doing cultures but never could determine what it was. I was never given a diagnosis, despite being told it could cost me my leg. They finally sent me home with a big bottle of Cipro and I took them for a long long time. It cleared up but only after almost 2 months. I am supposing that the initial infection site was bug bites as these critters love to feast on me. 6 months later, it struck again, but this time my left leg. Knowing what I then knew, I flew like the proverbial bat and almost knocked the doctors door down. This time it was quickly caught and the Cipro worked quickly, Cipro is specific to Staff and Strep type infections. 4 days ago – 16 years and 2 artificial knees later – I’m outside in nasty heat all day, meet my wife at an eatery for supper and I can’t stay in that freezing cold establishment. Took supper to go and went home, were it soon became obvious I was running a 103.2 fever, abet with no observable causes. Started in on the anti-fever meds, ate way to many of them in a short time. Around 4:30 am the fever broke, and my knee was sore right at the point of the incision (I’d had the new knees for 2.5 years by then). I freaked out as infections in artificial knees are very dangerous, to the point that when I called the surgeon I was told to be in his office in 45 minutes. I didn’t see the surgeon, but his Physicians Assistant who ordered tests and x-rays, and soon told me “no blood clots” and that it wasn’t in “the hardware” and might be cellulitis. To be in the safe side he put me on Levofloxacin and sent me home. At the time he saw me, I had almost no redness and only very minor swelling but my knee was extremely tender. Within hours that changed, my lower right leg had swollen up to a 27 inch circumference and was very splotchy and bright red. Very much like Richards’ pictures. Consider, if you will, that may women have waists in the 24-30 inch range. Looking up Levofloxacin scared the hell out of me, the drug has the infamy of having not one but 2 black box warnings – i.e. this stuff will kill you or maim you seriously and permanently. Thanks for sharing your story; this is so useful to anyone else going through it. Best wishes for a full recovery. I was hospitalised many years ago now…early 90s… with a moderately severe case of cellulitis (misdiagnosed initially so got much worse than it need have done) which recurred again two years later. I wanted to share something that may or may not help you/others at some stage later in your recovery. In my case, after the pain had gone I was left with a large red patch covering most of the front of my lower leg which I felt looked unsightly and I didn’t like wearing skirts, short trousers, swimsuits etc as a result. Then, several years after that and for for completely different reasons, I went to a slightly old fashioned health farm in Austria where they had traditional treatments. One of them…to help circulation…was hot and cold plunge baths for legs and feet. I did this every day for four days. Rapidly after that (within a matter of weeks) the red decreased and eventually disappeared completely which was not something I had expected or even dared hoped for. We were supervised doing this so I’d caution care with the temperature of the water and timing etc…better check with your own doctor first. I presume my circulation system just needed to be shocked out of its sluggish complacency to do the job it was designed to do. Since then, perhaps coincidentally, no further episodes although I still have an antibiotic prescription that one doctor gave me to keep in the house…”speed is of the essence with you cellulitis sufferers and you’ll know when you’ve got it again so just get yourself on the antibiotics and you can do the chat at the docs after that.” Don’t know whether that’s controversial or not but I feel better having that prescription in the cupboard! I just wanted to say how brave and helpful your blog is. Well done to you for providing such eloquent words and important photos. 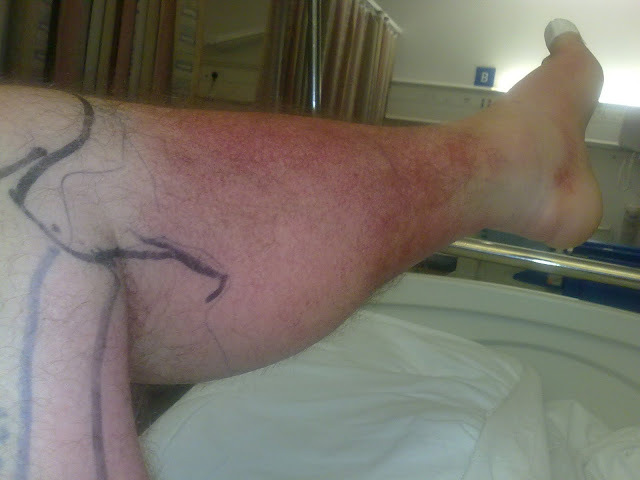 I have just recovered from cellulitis following a really nasty insect sting. I didn’t think it was serious until I popped into the hospital near my office and they admitted me straight away for IV. Luckily I did not have the problems you experienced and I really feel for you, especially for all the pain you have – and continue to – endure. My only complication was that after many gallons of antibiotics, it turned out am allergic to penicillin! As this was the first time I had been stung and the first time I had been given penicillin in my life, there was no way of predicting it and I know to avoid it now but a month – and many, many antihistimes – later, the very serious head-to-toe rash is finally almost completely faded. Having read your blog and the helpful comments from others, I will now be extra-careful over caring for my immune system and avoiding/treating bites and stings, plus watching out for any repeat symptoms. I wanted to say thank you for your work and to wish you all the very best for your continued recovery. Thanks for your post I am glad that you have found it helpful. I am glad you have recovered well and that the rash had almost gone. I can sympathise with you regarding being allergic to penicillin as my son is allergic and we only found out when he had an ear infection caused by chicken pox. Poor little mite ended up with a penicillin rash under the chicken pox, luckily he was too young to remember it but at least we are aware of his allergy. Thanks for the detail. Based on all I have read and seen fromyou and bloggers, I am sure this is my problem also. I will be calling my doctor ASAP. Thanks to you and all and prayers for your health also. Just read your account of you cellulitis. I guess I must be the luckiest patient in the world. I felt so badly for all of the people on the blog page who had such horrible time with this insidious disease. Thanks for your post, I am sorry to hear that you have been suffering. I think you are doing the right thing by going back to the doctor and wish you luck. Please do post with an update, its great to have other sufferers share their experience.